On the heels of Oprah Winfrey's popular live online discussions during premiere week of her new OWN series "Oprah's Lifeclass" (weeknights, Monday-Friday 8 p.m. ET/PT), Oprah will continue the live conversations every Friday night with "Oprah's Lifeclass: LIVE" throughout the series run on-air and online beginning October 21. 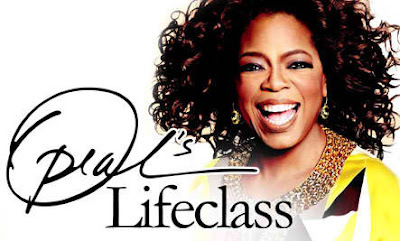 On Fridays immediately following "Oprah's Lifeclass" (8-9 p.m. ET/PT), Oprah will be live on-air and online (9-10 p.m. ET) chatting with fans and answering questions about the series which features her most personal revelations, all-new insights and life lessons from the 25 year history of "The Oprah Winfrey Show." "Our first week of online discussions for 'Lifeclass' generated an overwhelming response," said Sheri Salata, president, OWN. "Now, Oprah fans from around the world will be able to continue these powerful conversations every Friday night." The live nightly premiere week webcasts (October 10-14) garnered over 1.6 million streams on Oprah.com and on OWN's and Oprah's Facebook pages through both live and on-demand viewing. Per Omniture, Oprah.com traffic surged +60% versus the prior week with over 2.8 million page views to the "Oprah's Lifeclass" section. Monday, Oct. 17 - How Lady Gaga Found Her Calling: Oprah believes everybody has a calling, and music icon Lady Gaga is one of her favorite examples of this. Oprah reveals the devastating career setback that helped her discover her calling and turned out to be a blessing in disguise. Tuesday, Oct. 18 - Aging Well With Cybill Shepherd, Bo Derek and Beverly Johnson: Oprah talks to Cybill Shepherd, Ali MacGraw, Beverly Johnson, Jamie Lee Curtis and Bo Derek about what it's like to age in the spotlight. Plus, Oprah reveals her personal thoughts on getting older. Wednesday, Oct. 19 - Skinheads Then and Now: Maya Angelou once told Oprah, "When you know better, you do better." Oprah underscores this message with viewers by highlighting insightful and impactful stories from show guests over the years who learned from the mistakes they made. Thursday, Oct. 20 - Paula Deen's Rise To The Top: Oprah looks back on her interviews with Paula Deen and brain scientist-turned-stroke survivor Dr. Jill Bolte-Taylor to show how "you are responsible for your own life." Friday, Oct. 21 - Behind the Scenes Of The Flash Mob: Oprah reveals the inspiration for "Joy Rising Fridays" was the 20,000 person flash mob dance that kicked off her 24th season. Plus, Oprah's unforgettable Christmas Kindness trip to South Africa and surprises for Stevie Wonder and Tom Cruise fans.